If you want to automatically engage with your audience, you'll want to set up a drip email campaign. Drip email campaigns are perfect for engaging customers after they've performed a specific action, like signed up for something you're offering or purchased one of your products. Step 2: Click the "New Email" button at the top right of the screen. Next, select the email newsletter type you'd like to send (in this example, we're focusing on Drip campaigns) and give it a name. When you're done, press "Create & continue." Step 3: Select a Trigger (or a "customer action"). 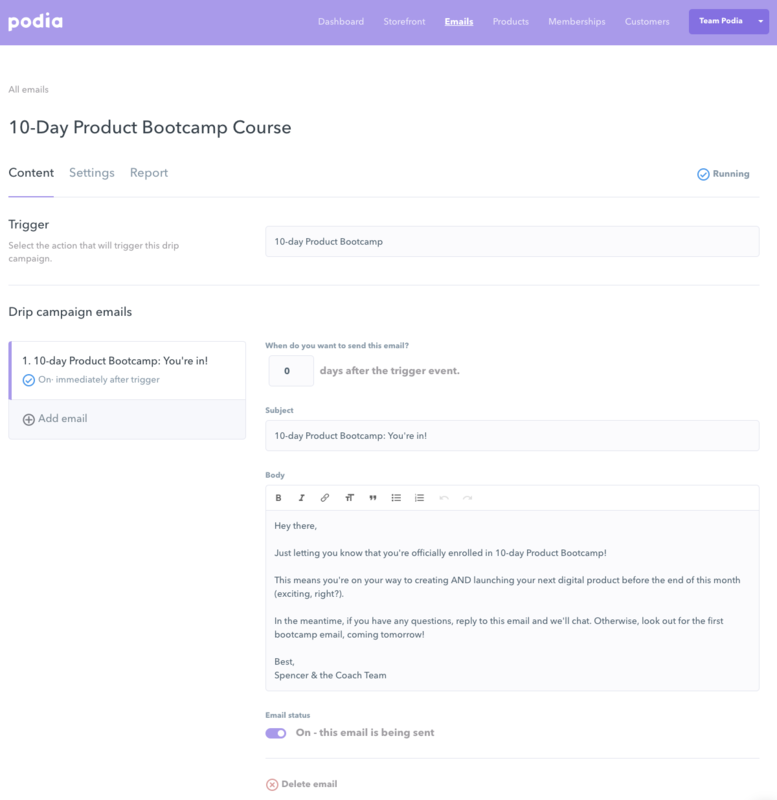 You can set up a drip campaign around a new signup or product purchase. Step 4: Once you've selected a trigger, you can begin adding emails into the drip campaign by clicking the "Add email" button on the left side of the screen. Next, choose when you'd like the email to go out (Day 0 means "send as soon as the action occurs," while Day 1 means "send 1 day after action occurs," and so on). Step 5: Once you've selected the trigger and when the email should go out, it's time to fill in the content of your email (subject line and body message). When the email is finished, make sure to click the "on" button at the bottom of the screen AND the "Turn Drip Campaign on" button at the top of the screen to ensure it's active. Step 6: If you'd like to add more emails into your drip campaign, simply click "Add email" on the left side of the screen to repeat the process. And that's it! If you still have questions about your drip email campaign, just reach out at [email protected] (or just click the little blue icon at the bottom right of the screen).